Forward James Henry meets with fans at last season’s autograph signing session. 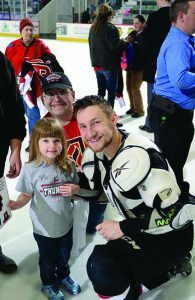 The Adirondack Thunder has announced its promotional schedule for the 2017-18 season. The Thunder’s 2017-18 home schedule, which consists of 36 home games, will begin on Saturday, Oct. 14, as the Thunder take on the Brampton Beast at Cool Insuring Arena at 7 p.m. Opening Night will feature a magnet schedule giveaway as well as an outdoor party on the plaza to kick off the Thunder’s third season, the first that the Thunder will open at home. The season will feature additional giveaways, including a Capital Region Hockey poster (Oct. 20), a Bill Dineen magnet banner (Dec. 9), a Christmas ornament (Dec. 23), a 2017-18 team poster, presented by Glens Falls Printing (Jan. 27), a youth jersey, presented by Glens Falls Hospital (Feb. 24) and a green Thunder T-Shirt (March 17). Giveaway sponsors and additional giveaway nights will be announced closer to the season, team officials said. Owlbert Einstein will be among the balloons that will be seen at the 45th Adirondack Balloon Festival Sept. 21-24 at Crandall Park in Glens Falls and Floyd Bennett Memorial Airport. The colorful and multi-themed hot air balloons will take to the skies again in the Glens Falls/Lake George area when the Adirondack Balloon Festival takes place Thursday through Sunday, Sept. 21-24. It will be the 45th annual event. It kicks off at 4:30 p.m. on Sept. 21 at Crandall Park in Glens Falls. Events continue through the weekend at Floyd Bennett Memorial Airport in Queensbury. 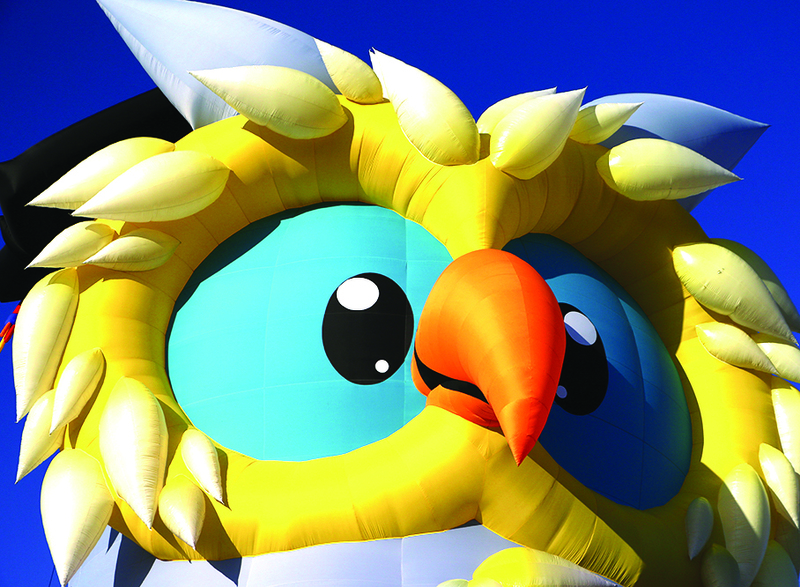 Some of the unusual balloons will include Owlbert Einstein, Scortch the Dragon, Smiley the Scarecrow and Pokey the Turtle. An American Flag balloon piloted by Barry Delibero will appear for the first time at the festival. It is 70 feet tall and 78 feet wide, organizers said. Scortch the Dragon also makes his first appearance, piloted by Keith Sproul. He stands 145 feet tall. This year’s event has band performances during the weekend by the Master Cylinders, North and South Dakotas, Buckeye Rooster, the Old Main and Across the Pond. Marti Burnley has been named the interim president of the ARCC. The Board of Directors of the Adirondack Regional Chamber of Commerce (ARCC) announced today that longtime area human resources, human services and workforce development professional Marti Burnley has been named interim president. In August, the Chamber announced that Tori J.E. Riley decided to leave her position. 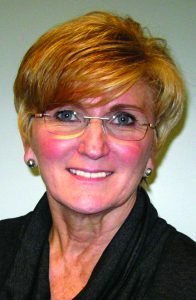 As of Sept. 11, Riley returned to a job she held previously, taking the position of vice president with the Saratoga Economic Development Corp.
Burnley, who retired from Hudson Headwaters Health Network in January after six years as vice president of human resources, has more than three decades of experience in leadership roles in both the private and public sectors. “Marti brings an outstanding array of professional experience, leadership skills, and a tremendous knowledge and love of our region to her new role,” said Dianne Shugrue, ARCC board chairwoman and president of Glens Falls Hospital. “Her great familiarity with the Chamber and the regional business community allow her to hit the ground running and keep the organization moving forward as we prepare for the next phase in the ARCC’s history. We are fortunate that she was willing to take a hiatus from her well-deserved and short-lived retirement to help us out,” Shugrue said. Burnley said she was surprised and humbled when she received the call asking her to consider the interim assignment, but knew right away that she wanted to accept. Gina Mintzer will become director of the Lake George Regional Chamber of Commerce. Mintzer began her new role under the tutelage of Consuelo on Sept. 11. Consuelo announced in April that he was retiring at the end of September. 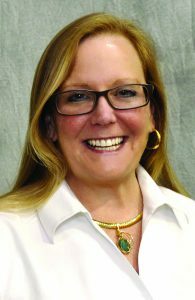 She managed programs, activities, and connections to build and sustain a healthy meetings and convention visitor industry. The Double H Ranch announced the appointment of board member Maureen E. O’Brien to the role of secretary and member of the group’s Executive Committee. O’Brien is a resident and native of Albany, New York. She is a graduate of the Academy of the Holy Names, the University of Norte Dame (B.A.) and New York University (M.A.). Her career has focused on new business development and government relations. Since 2007, O’Brien has worked for Motorola Solutions serving as the director of government affairs and in 2017 promoted to the executive director. Her work with Motorola Solutions focuses on interaction, education, advocacy and legislative activity with key funders and approvers of public safety communications projects. 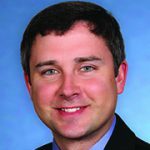 Andrew E. Clark, CFP, a senior financial planner at NBT Financial Services, a division of NBT Wealth Management, earned his master’s degree from the College for Financial Planning. Clark has over 12 years of experience as a financial planner. The master’s program curriculum is based on a client-centered, problem-solving method using case studies to give students a hands-on approach. Before joining NBT in 2013, Clark owned Clark Wealth Management, where he provided clients with financial planning and investment advisory services. Prior to that, he was lead financial planner and wealth advisor at Cornerstone Wealth Management Group, where he developed comprehensive plans for the firm’s high net worth clients. He earned his bachelor’s degree in economics at the University at Albany in 2000 and his designation as a certified financial planner professional in 2011. Clark is FINRA General Securities, Series 7 and 66 registered, held through LPL Financial. He also holds state licenses in life and health insurance and variable annuities. Kelli Germain, left, Cara Greenslade and Will Fowler have formed Sidekick Creative, a new graphic arts and branding company located in downtown Glens Falls. Three former advertising agency colleagues joined forces to to create Sidekick Creative, a graphic arts and branding company in downtown Glens Falls. The company operates out of shared space with Behan Communications. 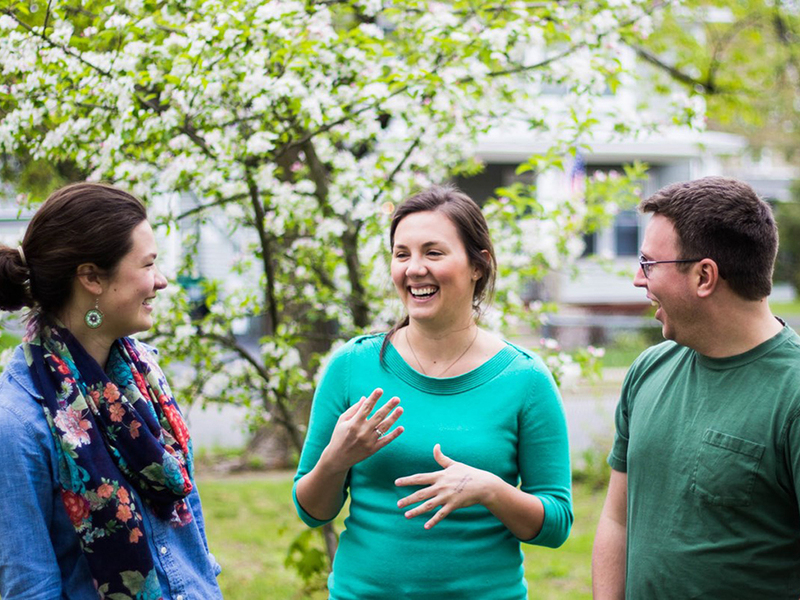 The three partners—Will Fowler, Kelli Germain and Cara Greenslade—grew up in Glens Falls. “Over the past 10 years, we’ve seen so many great businesses open their doors here and really revitalize the city. Now we’re excited to be one of those businesses and we hope we can have an impact on the city like so many others already have,” Greenslade said. Sidekick also produces a line of products including greeting cards, tote bags and prints. They have been selling those online and also at craft fairs and stores, including some retailers in downtown Glens Falls. The company’s main business, however, is helping other enterprises get their names out in front and build their brands. Sidekick designs logos, signs, shopping bags and more to help their clients identify themselves in the marketplace. A new juice bar in Pensacola, Fla., is about to open with signs and logo by Sidekick. A 13-year-old retail clothing store in Bolton Landing got a Sidekick makeover from shopping bags to signs. 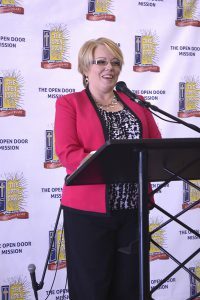 Kim Cook speaks at the groundbreaking event for the Open Door’s Warren Street project. The first phase of the Open Door Mission’s construction and renovation project is underway. The board and staff of the mission recently welcomed community leaders, donors, and guests at an official groundbreaking. This mission has received grants, gifts, and pledges that enabled it to begin the first phase of renovation at the property they acquired last December at 226 Warren St. Phase I will provide the foundational infrastructure and the accompanying build-out to accommodate men and women so that Code Blue can operate for the first time under its own roof this winter. It will also provide for the day room, a classroom and the Open Door offices. Once Phase I is completed in 2018, Phase II fundraising. That will include building a chapel, a dining room for 100 people, a food pantry and a welcoming and secure new entrance for guests. Lake George Region Restaurant Week is in progress, running through Saturday, Sept. 16. The Lake George Regional Chamber of Commerce & CVB announce the participating restaurants in the second Restaurant Week of 2017 are: Adirondack Pub & Brewery, the Algonquin, the Barnsider Restaurant, the Boathouse Restaurant, Ciro’s at Rocky Ridge, Giovanna’s on the Lake at The Georgian, the Inn at Erlowest, the Log Jam, the Lobster Pot Mario’s Restaurant, Mama Riso’s and Sushi Yoshi. The first Restaurant Week this year took place in June. During this special week, dining patrons can enjoy a prix-fixe three-course meal for only $20.17, not including tax or gratuity. “As we see from our restaurant week surveys, this special week is an introduction for many people to new restaurants. We also see quite a few people from out of town filling out surveys,” Metzger said. The menus are available at www.lakegeorgechamber.com. The Adirondack Trust Co. Community Fund will accept grant applications from eligible nonprofit charities until Sept. 30. Grant information and application forms may be obtained from the Adirondack Trust Company Community Fund website at ATCCF.org/nonprofits. The fund was established in 2009. Officials said the resulting yearly Lend-a-Hand grants help improve the quality of life and address issues of common concern in the area. In 2016, the Community Fund allocated $42,270 toward 23 Lend-a-Hand grants. The grants funded local, nonprofit organizations’ programs in such diverse areas as veterans’ outreach, mental health services, wildlife education, homelessness prevention, youth services, and the arts. Grant recipients will be announced by the fund’s Independent Advisory Committee in December. Over the past six years, the Community Fund has provided 101 grants in excess of $193,000. Barkeater cofounders Jim and Deb Morris went to Great Britain to train on this new equipment so they could familiarize themselves with it and train their staff. 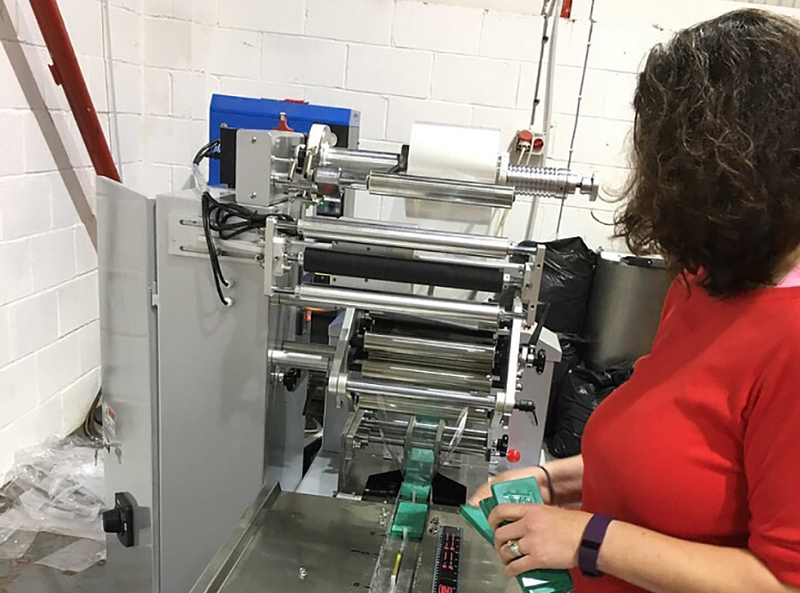 Barkeater Chocolates in North Creek commissioned new machinery last spring to be manufactured specifically for them to help facilitate the packaging of many of their chocolate products, including bars and peanut butter cups. In August, cofounders Jim and Deb Morris went to Great Britain to train on the new equipment so they could familiarize themselves with the intricacies and bring back the knowledge to their staff. He said that because the process of packaging the chocolates will be faster, the staff will be able to make more chocolate on a daily basis. The production facility will be reconfigured to allow for a more efficient workflow and to welcome their new addition to the factory. The brewery and taproom at 1043 Route 9, changed its name to Lake George Brew House. The brewery and taproom located at 1043 Route 9, between Northway exits 19 and 20, recently changed its name to Lake George Brew House. The 22,000 square-foot brewery features a spacious taproom to sample the beers (and soda and cold-brewed coffee) crafted on premises. All the beers served in the taproom are brewed in-house, hence the new name, according to ownership. 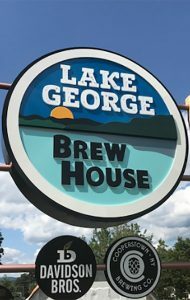 Currently, Lake George Brew House brews beers for Cooperstown Brewing Co., Harlem Brewing Co., Davidson Brothers Brewing Co., and more. The Lake George Brew House team is also installing a three-barrel pilot system to develop new craft beers for its own house brand. The house beers are scheduled to be on tap at the brewery in October.